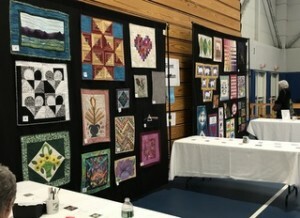 The Silent Auction at our World of Quilts Show features beautiful art quilts, wall hangings, crib quilts, and table runners created by our very talented guild members as well as amazing enormous Fat Quarter Frenzy Baskets. Be sure to check out our Silent Auction pieces – place your bids or buy it now. Silent Auctions held both Saturday and Sunday with different offerings as well as FAT QUARTER Baskets each day! We promise you will take home a new treasure. Please help by donating a special item, keep the following guidelines in mind: art quilts, wall hangings, crib quilts, and table runners are all accepted with a perimeter less than 200″. We are also collecting fat quarters to fill our silent auction baskets. Collection of items generally starts in January and runs thru April.